Yes, life for this humble metadata tag would be mighty confusing. As it happens, hashtags can be confusing for content marketers, too. We know we need to use them, but what’s the best approach? Facebook’s recent decision to support hashtags (users were already able to include them in status updates, but they weren’t clickable) has upped their cache in social media content. As an integral part of social and content marketing platforms like Twitter, Facebook, Instagram, Pinterest, Tumblr, and Google+, hashtags represent an important means of digital marketing and communication. Hashtags originated as a way to define and assemble topics of conversation online so that users could track down posts related to a group or event they were interested in. They’re still ideal for classifying content, whether posts apply to an upcoming conference your business is hosting or to the products offered by a school supplies manufacturer. When you upload social media content, use hashtags to further describe its purpose and the value it offers to its audience. For example, if your content relates to a topic like #kids, #fallfashion, #artprojects, or a #holidaysale, say so by including a hashtag. Delineating posts in this manner is particularly vital to promoting your brand content. You likely already include hashtags related to your products and brand, but have you considered using them to provide additional information about each piece of content? For example, Dairy Queen labels its Tumblr page posts with tags like #DairyQueen and #LoveMyDQ, but it also uses hashtags like #cake, #chocolate, and #pumpkinpie. 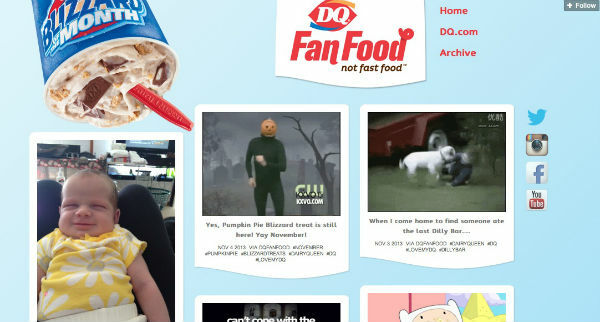 By tagging menu item flavors, DQ better defines its branded photos, videos, and animated GIFs, making it easier for social media content consumers to find them. In addition, beauty brand TRESemmé takes a similar approach by supplementing its branded hashtags on Tumblr with tags like #cute, #beauty, #hairstyle, and #brunette. This helps users to better understand the nature of its visual content efforts, as well as what to expect from future posts. Hashtags are useful for defining content, but they can also extend the reach of your brand on the whole. Think of them as search marketing keywords, but with one differentiating feature: Unlike the keywords in your paid search campaign — most of which are built around highly specific, less common “long-tail” terms — most of the hashtags you use should already be popular. By employing tags that are frequently searched you’ll greatly increase the odds that your content will be displayed and get shared. 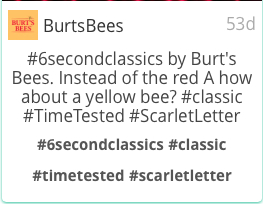 Burt’s Bees drew attention to its recent #6SecondClassics branded videos by tweeting the clips along with hashtags specific to the campaign. 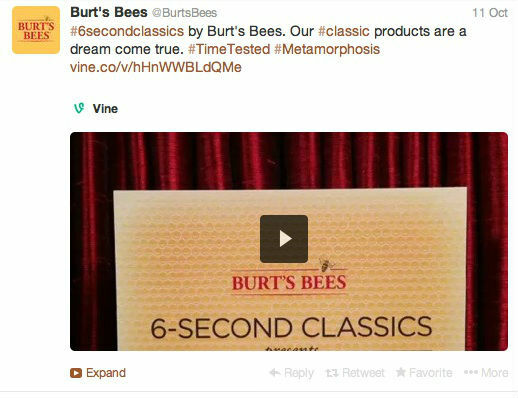 But the brand also made sure to include a more popular tag — #classic — to broaden its reach. 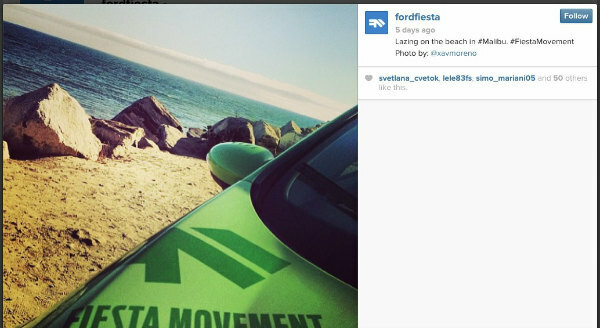 Ford Fiesta did the same on Instagram, supplementing the #FiestaMovement tag it uses on cross-country photos of the Ford Fiesta with more popular options like #travel, #florida, and #malibu. You can gauge the popularity of trending hashtags at Hashtags.org or by searching for potential candidates on Twitter itself. You’ll also find a list of up-to-the-minute trending tags on Tumblr. While most of the hashtags you include in your posts will already exist and serve the utilitarian purpose of getting your content found, hashtags can also afford an opportunity to showcase your brand’s creativity. One strategy is for brands to appropriate existing hashtags and make them their own. Ben & Jerry’s cleverly adopted several of Discovery Channel’s “Shark Week” hashtags in an effort to capitalize on the attention generated by the week-long TV programming event. 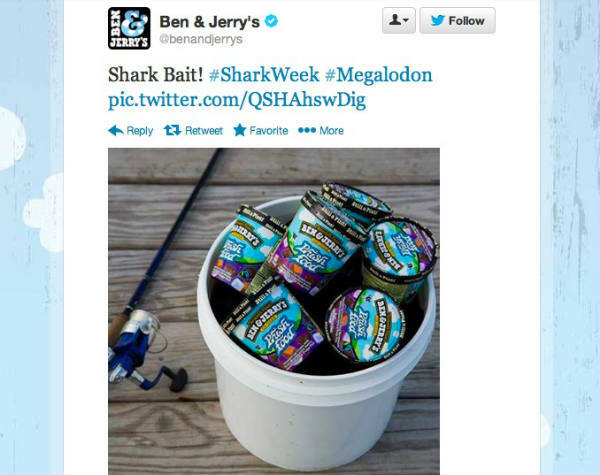 Existing tags like #megalodon, #SharkAfterDark, and #SharkWeek — a title that has long been part of the consumer lexicon — were used to attract attention to Ben & Jerry’s shark-themed Twitter posts. One of its branded photos featured a bucket of Phish Food ice cream next to a fishing pole. Another showed a pint marred by a jagged bite mark. If you prefer, your brand can go the conceptual route, inventing hashtags with the hope that they’ll take off. This has worked for brands like MTV, which coined the hashtag #FollowMeMTV as a twist on “Follow Friday” (#FF) — a Twitter custom in which users recommend other users to follow on the site. 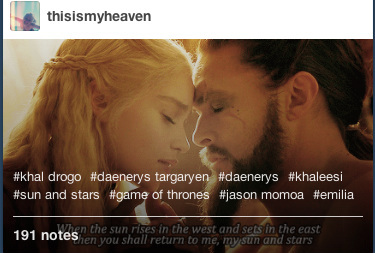 It has also been successful for HBO’s “Game of Thrones,” which whips fans into a frenzy with unique tags like #SunandStars. The short-lived term of endearment used by two characters in the show seems obscure, but die-hard viewers understand its meaning, and these are the consumers you can most rely on to advocate and share content from your brand online. This may sound counterintuitive, but as useful as incorporating hashtags can be, it’s also possible to overdo it. Too many of them in a single post and your message will read like spam, which could alienate social media content consumers, or cause them to tune you out. While theories about the optimal number of tags vary, you’re generally safe with one to three per post. Think of viewers of your content as readers: Ultimately, hashtags are a distraction that detracts from the message you’re trying to relay. Include them, by all means. But always do so in moderation. Deciphering hashtags is simply a matter of knowing how and when to use them. Stay abreast of social site developments and hashtag trends to help your content thrive.